The pioneer chairman of the Subsidy Re-investment and Empowerment Programme, SURE-P, Dr. Christopher Kolade, on Monday, revealed the reason behind his decision to step down from his position in 2013. The former Nigerian High Commissioner to the UK said he resigned because the operations of the SURE-P were becoming tainted with corruption and politics, thereby losing its credibility. Shedding more light on what transpired, Mr. Kolade said some officials of the administration of former President Goodluck Jonathan were practising “something that was lower than the transparency” expected of an interventionist agency like SURE-P‎. He said he met resistance when he raised objections as he was overruled by some powerful forces within the administration. He spoke on Channels Television Programme, “Views From The Top” anchored by Modele Sarafa-Yusuf. 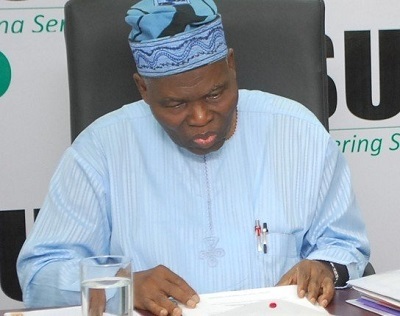 Mr. Kolade, 83, quit his position as chairman of SURE-P in November 2013, citing advanced age at the time. He said having attained 80 years of age, he wanted to reduce his involvement in energy-demanding activities. “I explained in the letter (to the president) that having done this SURE-P programme for two years and because within the next month I would be clocking 81, I am giving up some activities that take my energy”, he said. Mr. Kolade was called out from retirement by then President Jonathan to head the SURE-P in February 2012 after nationwide protests following the sudden removal of subsidy on petroleum products. The SURE-P was mandated to use money saved on removal of subsidy to create jobs, build roads, improve healthcare especially in the rural areas and other people-oriented programmes. Although he cited advanced age, speculations were rife that Mr. Kolade, who has a reputation for integrity, resigned due to corruption at the agency. The speculation was confirmed when he featured on the TV programme yesterday as he said he resigned his position because “he realized that some of the values and standards agreed on in the beginning had become diluted”. He said he found out that some of the decisions the agency was making did not meet up with the standard they had set it up for. “The government realized people would not believe what they were saying”. Mr. Kolade said. “And the President said ‘we need to gain credibility with the people in this programme. So we believe that if you and your committee can manage this thing transparently in accordance with what we agreed, then that credibility will be there’. “Now that’s fine. But when I discovered that there were individuals in the system that were practicing something that was lower than the transparency that we went in with, I raised the issues. And I discovered that political affiliations and things made this difficult”. The former SURE-P boss recalled a particular instance when the agency decided to employ 5000 youth from every state of the federation. According to him, when the agency commenced the process, it was told the arrangement it adopted was unacceptable. He said, “We started by saying that we would offer employment to 5000 youths from every state. Of course if you are sitting in Abuja, and you want to identify 5000 youths in all the states, it is difficult unless you involve people who are on the spot. “Now, it was the feeling of our committee, led by me, that to identify people in the states, we needed people who were political neutral. In other words, get civil servants to go in there and say according to the criteria you‘ve agreed, these are the 5000 youths from this state. But we were told that would not be acceptable. “So something was set up called State Implementation Committees made up mainly of people with political affiliations with one party or the other. When that was brought into play, I pointed out that I feared this would politicize what we were trying to do. And that therefore I felt we should take politicians out of this. But I was overruled by those who had the power to overrule me. “And then, it started happening. I got complaints from Abia state, from Ekiti state that many of the youths being recruited into the programme were supporters of party A or party B and I went back, and said what I suspected is beginning to happen. “So we need to kill this thing right away and go back to what we agreed. Now, somehow, we couldn’t do that. And for me, if you destroy the foundation on which you are setting up something like that, if you feel that credibility is the key to success in this thing, and then you undermine credibility by politicizing the issues, you are shooting yourself on the foot. And I’m not very good at shooting in the foot because I find out I can’t walk very well after that”.